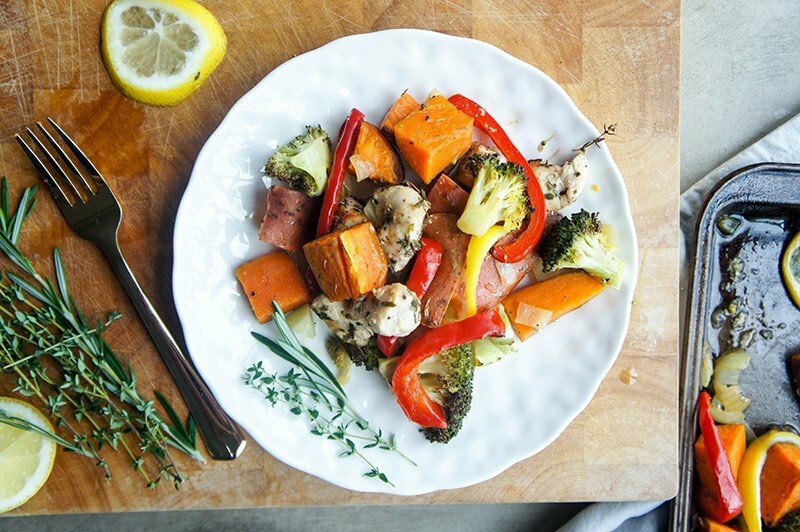 Weeknight dinners don’t get easier than this Herbed Lemon Chicken and Sweet Potato Dinner. Everything can be prepped in 10 minutes and roasted in 35- plus there is only 1 pan to wash! Whole 30 approved! This dinner was born out of my realization that I do way too many dishes. I counted the other day, and I had used 5 glasses by 4:00 in the afternoon. It’s not unheard of for me to use 3 pots and pans to make dinner, plus a cutting board, and because I tend to be messy, the floor needs to be cleaned up afterwards, too. 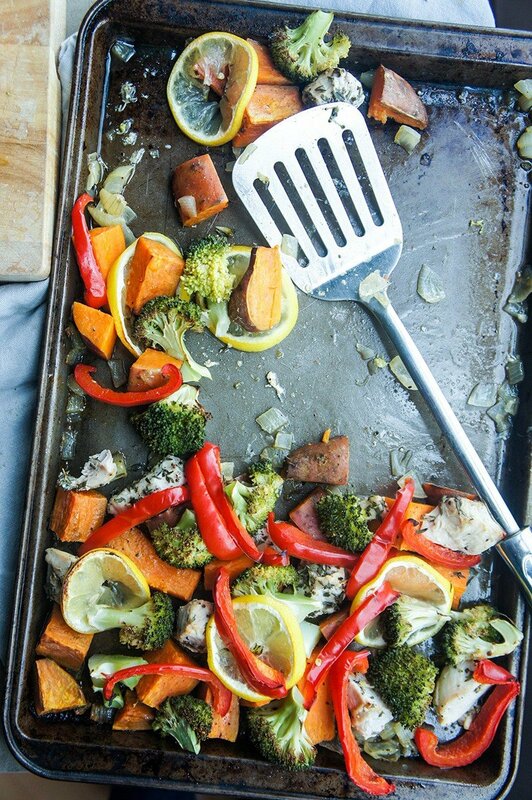 We made this quick and easy sheet pan dinner last week, and then 3 times after. I couldn’t believe how much flavor was concentrated into the vegetables simply by adding onion and lemon slices. The truth is, I’d rather do a sink full of dishes than rely on convenience food that is void of flavor and nutrients. But if I can have the best of both worlds, which this recipe shows I absolutely can, that is the best. I recently added a new category to my recipes– Family Favorites. This is getting tagged as one, because I couldn’t keep Xander away from this pan while I was photographing it. 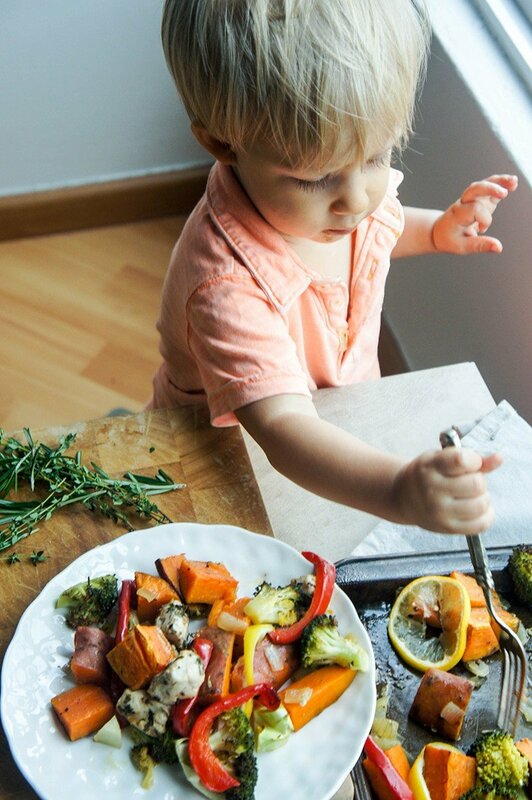 Kids love sweet potatoes- and what a great way to give them healthy carbs, and tons of vitamin A and fiber. The Creamy 4 Veggie Macaroni and Cheese I posted last week is another recent family favorite. Other toddler approved dishes we’ve been making for him and his friends lately are my gluten free chicken nuggets, Slow Cooker Moroccan Pumpkin Chicken, and Butternut Turkey Baked Spaghetti. This is customizable! Other veggies we love to roast are carrots, brussels sprouts, parsnips, cauliflower, and zucchini. Throw what you have on hand into this dish. Don’t leave out the onion or lemon slices if you can! The lemon juice and juices from the chicken result in super flavorful sweet onions that really make this dinner special. Save time: Use store bought trimmed vegetables, then all you’ll need to do is chop up the chicken, chop an onion, and slice a lemon. Easy peasy. For the Family: When Xander was younger, he loved dishes like this, but needed the veggies cooked a bit longer than the rest of us like them. I would just leave his veggies in the oven for an extra 5-10 minutes until they were really soft. Now he is fine eating them just like we do. Chop chicken into large cubes, and add to a bowl. Add chopped herbs, sea salt, black pepper and lemon juice to the bowl with chicken. Mix well, and set in the fridge to marinate while the preparing the vegetables. To a sheet pan, add 1 tablespoon olive oil, and spread to coat. Add chopped onion and large cubes of sweet potato to the pan, season with sea salt and pepper to taste, and put in the oven for 15 minutes. After 15 minutes, pull the pan out, and add the chicken around the pan. Put back in to bake 10 more minutes. Pull the pan back out, and add broccoli, red bell pepper, and lemon slices. Add back to the oven for 10 minutes. Serve right out of the oven while everything is still hot. The onions at the bottom of the pan absorb all the delicious flavors! 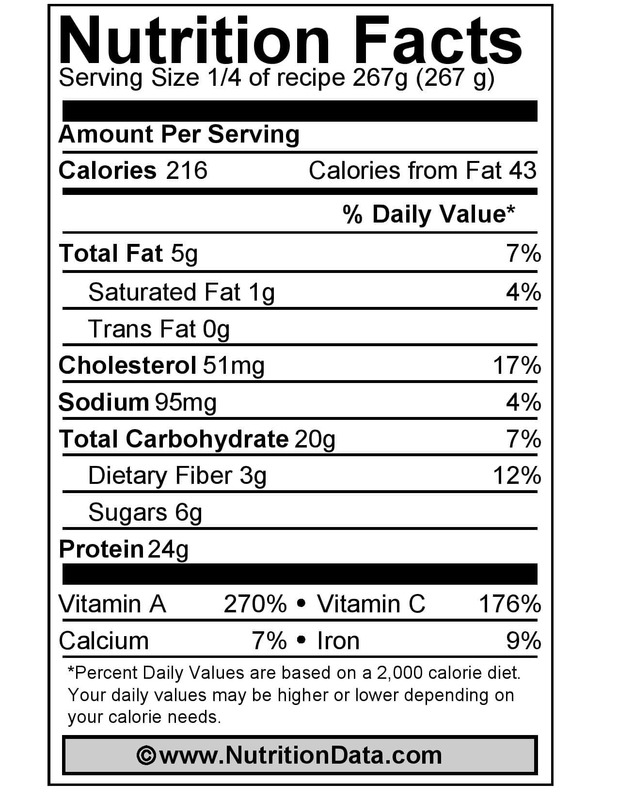 Nutritional data for Sheet Pan Herbed Lemon Chicken and Sweet Potato Dinner and images courtesy of www.NutritionData.com. O this could just be dinner every night and I'd be satisfied! We have a variation of this at least once a week-- but I don't usually add lemon. That is a new must! Nice dinner- protein, veggies & starches. All on one sheet pan, all beautifully prepared. In other word...YUM! You had me at lemon. 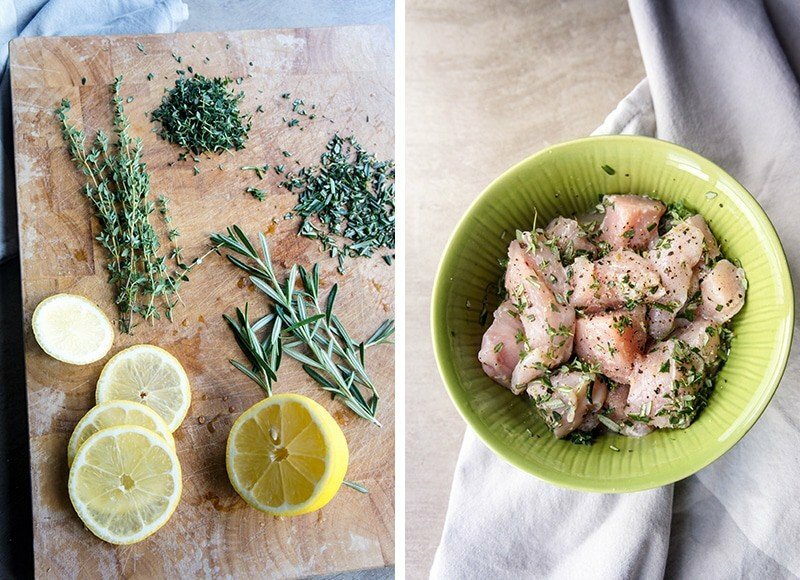 I love how simple this recipe looks! And I'm just as messy a cook as you are. Especially when I create fondant cakes. It's like a tornado has run havoc through my kitchen. Haha. You would think as food bloggers we would come up with ways to make less of a mess in the kitchen! I know at my other job I was always really good at keeping my desk and office organized... but my kitchen, even though it's now my "work"? Ha! 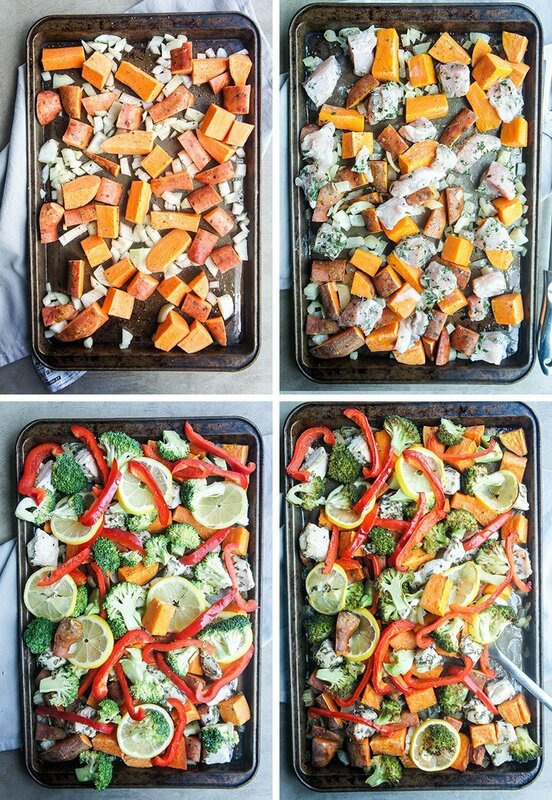 I really like one pan cooking and chicken and sweet potato is a great combination. What a gorgeous looking recipe! I too am terrible for making too many dirty dishes. I completely trash the kitchen every time I make something, so this recipe is a winner for me! Yum! Exactly! I really need to be more mindful of the dishes I use while cooking-- it's totally out of control. 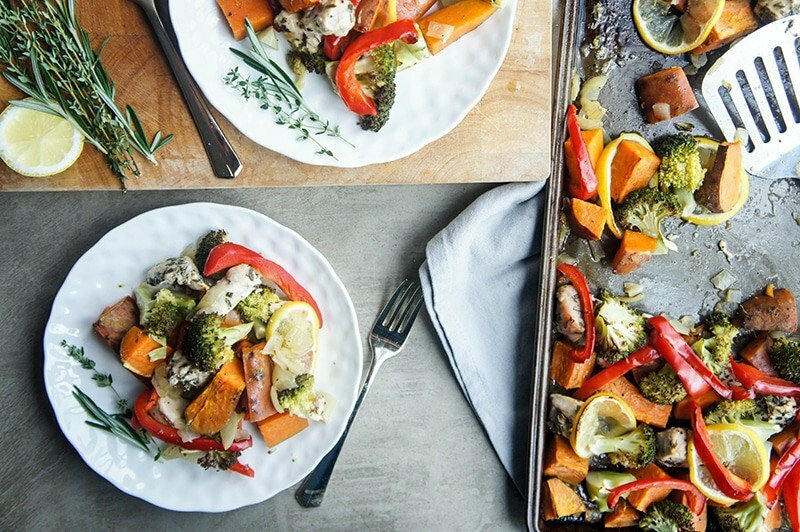 I love that this whole meal can be created on one sheet pan! My husband will be happy that he won't have to do as many dishes haha. 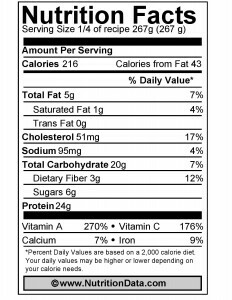 And it's healthy. Love this! My husband doesn't think it's his job to clean up after I cook, so streamlining the process has become a must since our son arrived! I love a one pan dinner! My sister loves lemon, I'll have to make this next time shes in town!! I've just recently learned how amazing a sliced lemon makes roasted vegetables. It gets so sweet as it roasts and becomes concentrated! Hi Martha, Wow this looks yummy! Thank you for posting this. It looks like your little boy loves it too! Will definitely try and come back to check more of your recipes. Cheers! Thanks James :) It's a great recipe-- I'd love to hear how you like it!